So one of my 5-year-old daughters saw a segment on goat's milk on a kid's show she watches, not sure which one, and has been asking for it ever since. I wasn't sure if she would like it, I had never tasted it before, but I am always up for them trying new things so I bought a quart. Without hesitation she drank it down and announced that she would drink a cup of goat's milk everyday to stay healthy. So what are the health benefits of goat's milk and how is it different from the cow's milk we are all used to? Delicious with a slightly sweet and sometimes salty undertone, goat's milk is the milk of choice in most of the world. Although not popular in the United States, it can be found in markets and health foods stores throughout the year. Unlike cow's milk there is no need to homogenize goat's milk. While the fat globules in cow's milk tend to separate to the surface, the globules in goat's milk are much smaller and will remain suspended in solution. When individuals have sensitivity to cow's milk, goat's milk can sometimes be used as an alternative. 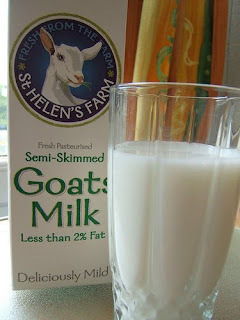 Goat's milk is a very good source of calcium and the amino acid tryptophan. It is also a good source of protein, phosphorus, riboflavin (vitamin B2) and potassium. Perhaps the greatest benefit of goat's milk, however, is that some people who cannot tolerate cow's milk are able to drink goat's milk without any problems. It is not clear from scientific research studies exactly why some people can better tolerate goat's milk. Some initial studies suggested that specific proteins known to cause allergic reactions may have been present in cow's milk in significant quantities yet largely absent in goat's milk. Goat's milk is a very good source of calcium. Calcium is widely recognized for its role in maintaining the strength and density of bones. In a process known as bone mineralization, calcium and phosphorus join to form calcium phosphate. Calcium phosphate is a major component of the mineral complex (called hydroxyapatite) that gives structure and strength to bones. A cup of goat's milk supplies 32.6% of the daily value for calcium along with 27.0% of the DV for phosphorus. In comparison, a cup of cow's milk provides 29.7% of the DV for calcium and 23.2% of the DV for phosphorus. Goat's milk is a very good source of riboflavin, a B vitamin important for energy production. Riboflavin (vitamin B2) plays at least two important roles in the body's energy production. When active in energy production pathways, riboflavin takes the form of flavin adenine dinucleotide (FAD) or flavin mononucleotide (FMN). In these forms, riboflavin attaches to protein enzymes called flavoproteins that allow oxygen-based energy production to occur. Flavoproteins are found throughout the body, particularly in locations where oxygen-based energy production is constantly needed, such as the heart and other muscles. Goat's milk is a good source of low-cost high-quality protein, providing 8.7 grams of protein (17.4% of the daily value for protein) in one cup versus cow's milk, which provides 8.1 grams or 16.3% of the DV for protein. The structure of humans and animals is built on protein. We rely on animal and vegetable protein for our supply of amino acids, and then our bodies rearrange the nitrogen to create the pattern of amino acids we require. Goat's milk is a good source of potassium, an essential mineral for maintaining normal blood pressure and heart function. Since a cup of goat's milk contains 498.7 mg of potassium and only 121.5 mg of sodium, goat's milk may help to prevent high blood pressure and protect against atherosclerosis. what a great post! I've never had goats milk before but I've been wanting to try it. Good information to know!